Ever exhilarating: take a ride round the cross-country course at the Fair Hill International in Maryland with the wonderful Henny and Peter Atkins of Australia. Henny (whom I wrote about briefly here) loves cross country, as you can probably tell by his ears, which are pricked all the way round. Atkins says he once saw Henny standing stock still in a turn-out paddock at a major event, gazing into the distance where part of the course could be seen, as though he were working out his tactics. He’s now being syndicated, and I can’t imagine who wouldn’t want a piece of him. 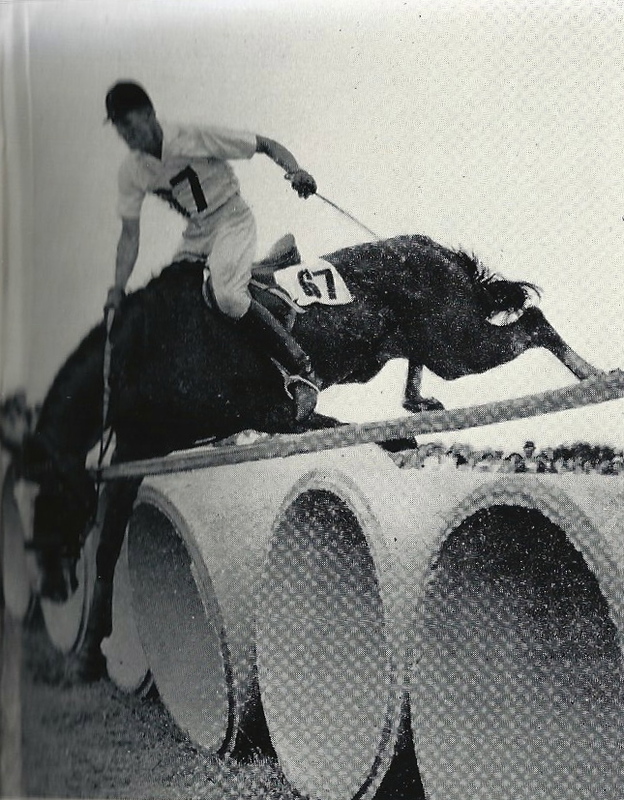 Yes, those are sections of concrete pipeline with a plank on top – a cross country fence at the Rome Olympics in 1960. From Pat Smythe’s Jumping Around the World (Cassell). Enjoy Eventing Nation’s footage of the cross country day of the Olympic Test Event in Greenwich Park. The extremely enthusiastic South London schoolkids made it for me. Peter Atkins of the Australian team and his horse Henry Jota Hampton, or Henny, take us round the World Olympic Games 2010 cross-country course in Kentucky courtesy of a helmet cam. Just watch those ears! If you want to contribute to this partnership, or learn more about Henny, who was picked up by Atkins for a song because he’d burned out as a show horse, click here. Henny combines eventing at top level with leading rein classes with Atkins’ two year old son, and, off the cross country course, has been known to be scared of shadows – not that you’d know it from this video. They finished 24th overall – not shabby. At 26A he jumped up great and stalled on top, I’m not sure why. We slipped off the﻿ far side, I checked to make sure he was OK, trotted around the corner and jumped the option. The Stevenson Brothers have made a rocking-horse replica of three-day eventer Headley Britannia which will be just one of the lots in a British Horse Society auction to aid their Drawing the Line campaign against irresponsible breeding. Sadly I couldn’t track down a photo, nor a shot of another famous rocker I read about – a lifesize Anglo Arab created for Harrods a few years ago. UPDATE: see photos of the Headley Britannia rocking horse and Headley herself here.